Series 500 machines are multiple head pneumatically operated volumetric (piston type) units with a wide range of applications. 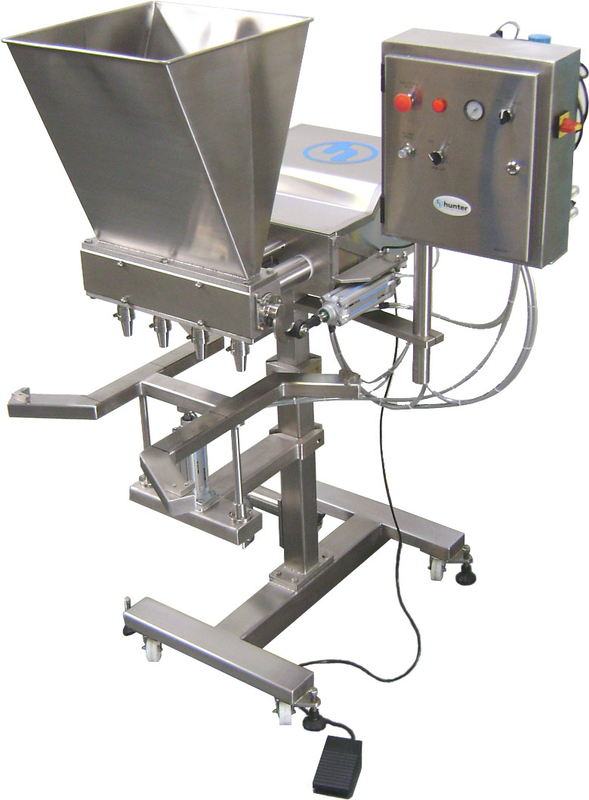 They are suitable for accurate dispensing of most liquid or semi liquid products and may be used for filling rigid containers, pouches or formed cavities on FFS machines – or, in the bakery industry, for depositing pie fillings, batters, cake mixes, toppings etc. Construction is generally corrosion resistant, with frame and covers fabricated in T304 stainless steel. All contact parts are manufactured from T316 stainless steel or suitable plastics, allowing them to be used for such diversified products as foodstuffs, cosmetics, pharmaceuticals, home care preparations and corrosive chemicals. Material may be handled hot or cold, and volumetric accuracy is usually well within +/- 0.5%. Available as single head (model 505) or in multiple heads up to 12 across. Volume range of 5ml to 5000ml with 6 metering cylinder options. Versatile design using pneumatic controls with foot switch or electrical initiation. Optional multiple stroke facility for larger fills. Product supply via 50 and 80 litre hoppers or with a suction hose from a bulk supply. For viscous products a product compensator and relief valve may be fitted. 3 types of product valve available - large rotary, extra large rotary and check valve. The large rotary valve can handle pieces up to 15mm across the corners. A wide range of non-drip shut off nozzles available with various outlets. Optional sub-surface filling facility and nozzles for filling foaming products. Can be set up as a manual or fully automatic filler with container indexing. Often used in conjunction with horizontal and vertical form fill seal machines. A range of portable stand shapes - low level and heavy duty with adjustable height.